"I'm sorry," and "Mind your own damn business." It’s been five days since his press conference, and I still can’t figure out why Tiger Woods apologized to me. I don’t care. I don’t even know the guy. I feel kind of creeped-out that he felt the need to include me (I assume I’m part of the “everyone” he was referring to) in the list of people to which he had to apologize. Dude, apologize to your wife, kids and the rest of your immediate family. Leave me out of it. It hasn’t affected my life at all. In fact, I played Tiger Woods ’09 on the Wii this weekend, and your extramarital affairs had very little effect on my enjoyment of the game. My advice, take a page out of Woody Allen’s playbook. The guy left his longtime love interest for her daughter, a daughter he practically raised. Did he feel the need to apologize to me? No, and I appreciate the fact that he didn’t drag me into the middle of that whole disgusting mess. Did it affect his career by not issuing a contrived public apology? No, he didn’t skip a beat. He didn’t miss work. He kept on being Woody Allen. You know what? I respect him for it. His behavior that led to the scandal was sickening. His behavior after the scandal was admirable. I understand that you have endorsement deals, and you’re probably getting pressure from the PGA, and there are possibly hundreds of millions of dollars at stake, but here’s one thing I know, your apology won’t make a difference on your future earnings. Right or wrong, you will be forgiven once you start winning again. If they slip that green jacket on you again, the spectacle of your string of affairs, the crash, the stories of your wife beating the ever-livin crap out of you, all of it will begin to fade. Win a bunch of tournaments, and the endorsement deals will be back bigger than before. That’s America, Tiger. Love it or leave it. 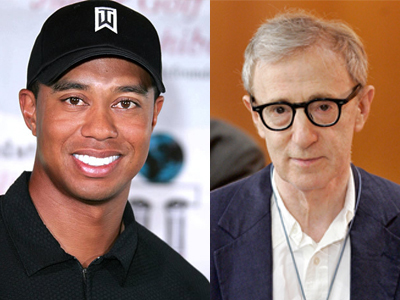 This entry was posted in Misc and tagged apology press conference, celebrity affairs, golf, mia farrow, pga, professional golf, the masters, tiger woods' girlfriend, woody allen. Bookmark the permalink.